Color Guard is the most respectful of all our teams in the War Eagle Battalion. The cadets who participate learn the value and importance of our flags and how to appropriately display them. Currently practice has not begun. Will be posted. 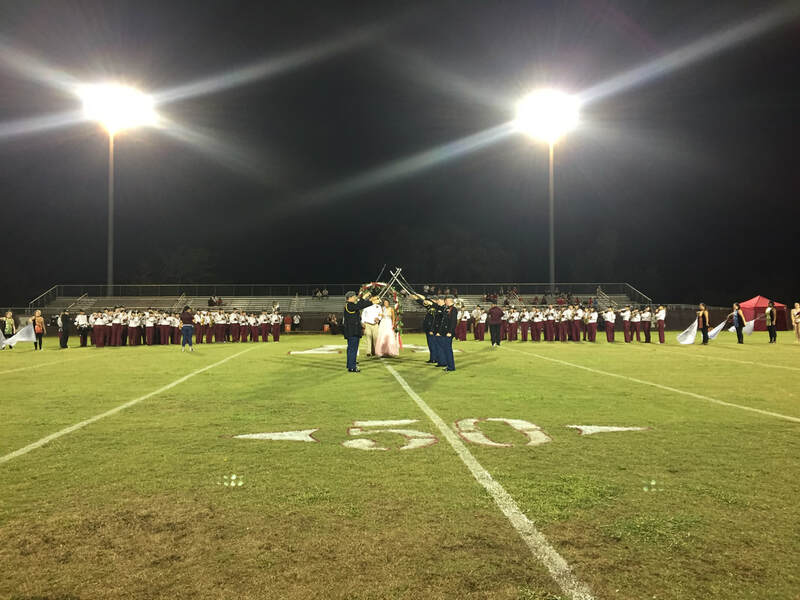 ​On September 21st, 2018, Members of the Color Guard held up sabers for the homecoming court during half-time of the football game. Cadets kept the sabers on the shoulders and raised them when a nominee walked under them. After each nominee lined up the Color Guard went back to the JROTC room to pack up and go home. 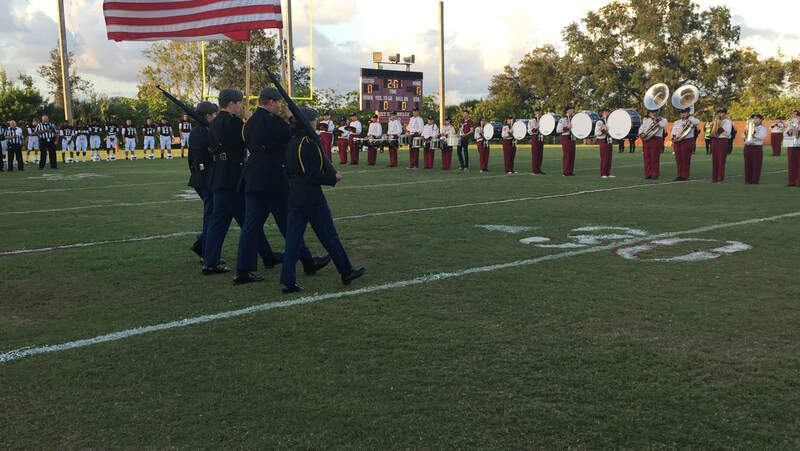 ​ On September 21st, 2018, The War Eagle Battalion Color Guard which consisted of cadets: Jessie Blackburn, Ethan Harman, Michael Mabry, and Briana Akins came to school at 5 P.M. to practice and start off our home game by presenting colors during the national anthem. On September 11, 2018, The War Eagle Battalion held a ceremony in honor of the lives lost in a terrorist attack 17 years ago. C/LTC DeVane was the MC of the ceremony where he introduced Dean Russell and gave commands to all companies. The cadets and students had a moment of silence and shortly after our Color Guard did the massing of the colors at half-mast. After the event, cadets that went to JCLC received their awards after the ceremony and helped clean up. ​On September 1, 2017 was the second football game of the year. There were a number cadets from our Astronaut High School JROTC War Eagle Battalion attended the game to assist the Color Guard and Flag Detail. Leading the team onto the field was C/CPT Roberge as the national flag. Following was C/SFC Davis carrying the Florida state flag and C/CPT Lugo and C/SSGT Harman were armed with rifles. ​On August 18, 2017, the War Eagle Battalion sent out their Color Guard team to present the colors for the first kick-off game of the season. Lead out by C/MSG Whitworth the Color Guard went out onto the field to start the game. To support our school, they dressed in neon shirts and the standard army ACU pants to celebrate school pride. There may have been bad weather conditions, but the Color Guard pulled through and was very successful. ​On November 11, 2017, 7 members of the War Eagle Battalion Color Guard attended a POW/MIA table ceremony at VFW post #4228 to honor prisoners of war and soldiers who are missing in action. The ceremony started off with an introduction by one of the members of the post who explained the tables meaning. The Color Guard walked out carrying hats representing every branch of the military with a hat added for all the women in the services. Candles were lit by all the members of post #4228 and led the Color Guard to the table. After the hats were ceremoniously placed, the Color Guard walked out and the ceremony continued. A table on the side was set for all the children whose parents were in the services. It honored them and their families.